Свободу Александру Кольченко!/Free Aleksandr Kolchenko! One of the four opponents of Russia’s annexation of the Crimea who was accused, together with renowned film director Oleg Sentsov and left-wing activist Oleksandr Kolchenko, of a Right Sector ‘terrorist plot’ has been sentenced to 7 years imprisonment. Typically, information about the conviction of Gennady Afanasyev, one of the two men, together with Oleksy Chirny, who gave ‘confessions’ while in police custody in Simferopol without access to family or a lawyer, was given by the investigator at a court hearing which extended Kolchenko’s detention to April 2015. There had been no reports of Afanasyev’s ‘trial’, or of the separation of his charges into separate proceedings. Mediazona reports that the sentence was passed on Afanasyev by the Moscow City Court which found him guilty of ‘terrorism’. The prosecution claimed that Afanasyev was part of a group led by Oleg Sentsov which in April 2014, acting on the instructions of the Ukrainian Right Sector created a ‘terrorist group’ in Simferopol aimed at “exerting influence on the adoption of decisions by the authorities of the Russian Federation on the Crimea leaving it”. According to this version, Afanasyev, Chirny and Kolchenko, as well as “other unidentified individuals”, on Sentsov’s instructions, carried out arson attacks on buildings of the Russian Community of the Crimea on April 14 and the local branch of the United Russia party on April 18. In both cases it was earlier reported that a Molotov cocktail had been thrown, with the Russian Community having a door slightly burned, and United Russia – a window damaged. The prosecution also asserts that, on Sentsov’s instructions, Chirny and Afanasyev obtained homemade explosive devices which were supposed to be used for two terrorist acts on May 9 – blowing up the monument to Lenin at the railway square in Simferopol and the Eternal Flame memorial. It claims that the explosions did not happen since both men were arrested first. This does not correspond with earlier information according to which Chirny’s arrest was considerably later. after the supposedly planned terrorist acts. According to the statement from the FSB on May 30, terrorist attacks were planned not on monuments, but on railways and other important parts of Simferopol infrastructure. There was nothing linking any of the four men with Right Sector, and none of the alleged terrorist acts took place. The four defendants were connected only by their shared opposition to Russia’s occupation of the Crimea. Russia has claimed that three of the men ‘automatically’ became Russian nationals because they did not go in person to the restricted number of offices in the Crimea to register their wish to retain Ukrainian citizenship. Any such claims have been roundly rejected by both Sentsov and Kolchenko and condemned by human rights groups and Ukraine’s Human Rights Ombudsperson Valeria Lutkovska. It is probably significant that the one defendant – Chirny who is recognized as a Ukrainian national and allowed visits from the Ukrainian consul has not yet been sentenced despite also having ‘confessed’. Suspicion that the two men’s ‘confessions’ were obtained under duress appear confirmed by the repeated allegations by Sentsov and Kolchenko that they were subjected to torture and pressure while in custody in Simferopol. Sentsov asserts that the investigators demanded that he testify against EuroMaidan and the new Kyiv government. He was told that if he refused, the charges against him would be increased. let alone the incentive to so risk his children’s wellbeing and his career. 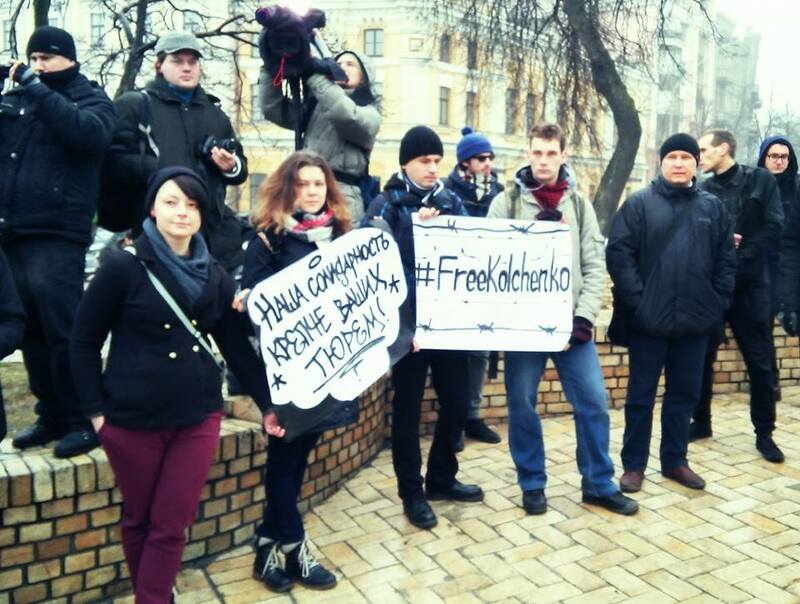 Kolchenko is a staunch anti-fascist and left-wing activist who would not be seen dead in a Right Sector conspiracy. The Memorial Human Rights Centre has recognized Sentsov and Kolchenko as political prisoners, and Amnesty International has called on Russian authorities to investigate Sentsov’s allegations of ill-treatment and to return the Ukrainian detainees to Crimea. A number of prominent European film directors, including Andrzej Wajda, Krzysztof Zanussi, Agnieszka Holland, Ken Loach, Mike Leigh, and Pedro Almodovar have also interceded on Sentsov’s behalf.